In honor of International Women's Day yesterday, I can't help but to briefly highlight the Minnesota Women's Consortium, where I'm honored to be a member of the Board of Directors and its Executive Committee. With a mission "to achieve full equality for women and girls by connecting organizations and individuals that share this common goal," the Consortium is a clearinghouse for leadership, information, and action! The Minnesota Women's Consortium is uniquely one of a kind nationwide. As a statewide collaboration of 160+ member organizations, the Consortium serves as a resource center to enhance equality and justice for women and children. As a clearinghouse, the Consortium keeps member organizations informed on issues pertinent to their work, increasing members' strength and impact. Since 1981, Minnesota women have come to the Consortium for opportunities to connect with other members and to discuss their concerns and proposed solutions. The Consortium is a national model in supporting vital local organizations working toward heightened awareness on women's issues, sound public policy, and ultimately, full equality for women. The most powerful testimony of the Consortium's collaborative efforts is their diverse and awe-inspiring membership, which spans the vast fields of women's issues, health, education, environment, good government, and more. Check out the latest issue of the Consortium's bi-weekly Capitol Bulletin update and so you don't miss out, subscribe today! 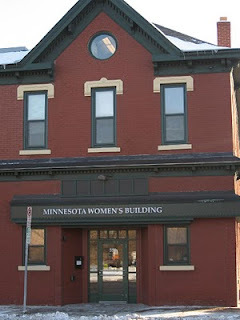 The Minnesota Women's Building, home to the Minnesota Women's Consortium and the League of Women Voters Minnesota , located two blocks from the Capitol, has various offices for rent. Availability ranges from the North Suite comprised of five various office sizes, reception area, conference room on the second floor to the Northeast Suite containing a small lobby, two offices, conference room on the first floor, and a small office on the first floor. For more information, contact Lorraine at info@mnwomen.org. Read more about the Minnesota Women's Consortium and feminist issues on their blog, Equality Quilt. Diane, You rock like granite! Thanks much for spreading the word about our spaces for rent. Love the Hafiz poem & pic. Love the name and tagline for your blog. Keep all the good stuff coming. Thanks, Bonnie! You give the most unique compliments;-) I'm always happy to spread the good word about the Consortium and its fabulous offerings!